High Quality Content by WIKIPEDIA articles! 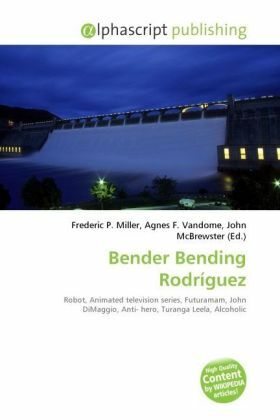 Bender (full name Bender Bending Rodríguez), designated Bending Unit 22, is a fictional robot character in the animated television series Futurama. He is voiced by John DiMaggio. In the series, Bender plays the role of a comic anti-hero, and is described by Leela as an "alcoholic, whore-mongering, chain-smoking gambler". He was built in Mexico and other characters refer to his "swarthy Latin charm", though he does not speak with a Mexican accent. He is also prejudiced against non-robots, often expressing an urge to "kill all humans".